Loretta has spent her life fighting for the fair and equal justice that is the foundation of our democracy. As head of the Justice Department, she will oversee a vast portfolio of cases, including counterterrorism and voting rights; public corruption and white-collar crime; judicial recommendations and policy reviews—all of which matter to the lives of every American, and shape the story of our country. Loretta’s confirmation ensures that we are better positioned to keep our communities safe, keep our nation secure, and ensure that every American experiences justice under the law. Loretta Lynch was finally confirmed as attorney general by the Senate Thursday after five months of being at the center of a partisan battle over a provision in a human trafficking bill, the Washington Post reports. The vote was slightly less narrow than expected because 10 Republicans ended up voting for Lynch’s confirmation—five more than expected. According to NPR, the 56-43 vote ensures that Lynch will be Eric Holder’s successor to head the Justice Department and become the first black woman to hold the position. Lynch’s confirmation had been tied to a partisan battle over an anti-trafficking bill that included an abortion provision that Democrats believed further restricted the procedure. Earlier this week, the Senate struck a deal to end the impasse, clearing the way for the confirmation vote. 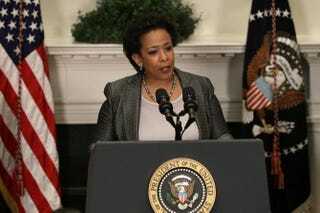 As the Post notes, Lynch also came under fire from Republicans when, during questioning before the Senate Judiciary Committee, she said she thought that President Barack Obama’s executive actions on immigration were legal and constitutional. The Senate Republicans who voted for Lynch are Majority Leader Mitch McConnell (Ky.), Kelly Ayotte (N.H.), Thad Cochran (Miss. ), Susan Collins (Maine), Jeff Flake (Ariz.), Lindsey Graham (S.C.), Orrin Hatch (Utah), Ron Johnson (Wis.), Mark Kirk (Ill.) and Rob Portman (Ohio).